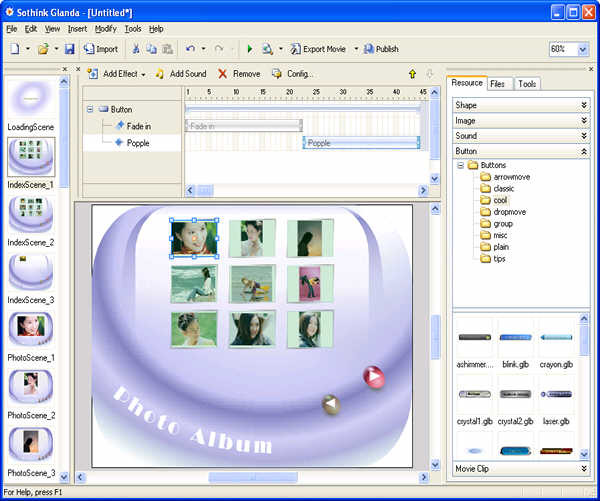 Sothink Glanda 2004 - Fast and Easy Flash Animation Software. Sothink Glanda is a template-based tool designed to create Flash movies for your web site in a fast and easy way. It allows you to easily create a variety of animated effects such as buttons, navigation, splash pages, graphic logos. It creates the same SWF file like Macromedia Flash, but doesn't require any Flash design experience or art design skill. WYSIWYG design panel and integrated preview makes the creation become more intuitionistic. It includes various well-designed templates such as animated buttons, text effects, motion backgrounds and greeting cards as well as vector shapes, images, sound files supplied for your convenience. In the 2001a version, it integrated an import tool which enables you to import shapes, texts, motions from other SWF files. And you can make interactive movies by linking your buttons to external Flash movies. You can create a new movie quickly by following the wizards. The wizard will guide you to create an animated Flash album, banner or navigation buttons in minutes. Effect :Dozens of built-in effects, Edit effects, Add multiple effects . Motion Path :You can also combine the motion paths with other animated effects. Currently, it has the Oval, Curve, Line and Scribble drawing tool to help you draw the path freely. Inheriting the key feature of Glanda 2001a--Button maker, Glanda 2004 remains the function and even improve it better. Hundreds of button templates stored in the Button folder of the Resource panel. You can also add more at your pleasure. For each button template, you can edit its text, color, shape and URL, etc. The most unique and magic feature Sothink Glanda 2004 provides is that you can create new effect, completely different from the built-in effects, by using the Effect Stacking technology. With a few carefully chosen and configured effects you are able to achieve lots of very unique and stylish effects. Built-in Resources:including animated buttons and motion backgrounds, As you can see the resources are grouped into Shape, Image, Sound, Button and Movie Clip . Drawing Familiar drawing tools, Edit easily, Image format and Ruler, Grid and Alignment . Rich Format Text Support rich format text such as bold, italic, character spacing, position, static and dynamic text and etc. Glanda supports MP3 and WAV sound formats. It also supports stream sound. Unlike event sound, stream sound can be played as soon as enough frames are loaded. This feature is useful while large sound files are used in the movie. A+ Screensaver Creator - The fastest and easiest way to create share screen saver and resell it , Flash Screensaver Creator just for yor.